And the errors seem to be legion in the book. The unattributed passages include text from Wikipedia, the Choice Organic Teas and an astrology site, to name a few. However, it appears that, even as Goodall works to correct the book, the scope of the scandal is growing. The Daily Beast recently posted an article saying that, “A quick check of other passages, randomly selected, suggest that there are many more instances of plagiarism that went undiscovered by the Post.” The article specifically points out several occasions where Goodall appears to give the impression she interviewed a person when the quotes were actually pulled from earlier articles. Goodall, for her part, has admitted to the presence of uncited passages calling them “mistakes”. However, the news coverage of Goodall has been vicious at times, calling her a liar, a plagiarist and much more. Goodall’s stellar reputation, one earned over a career spanning more than five decades, has taken a huge beating over the past week. Sadly, the delaying of the book and correcting of it isn’t likely to help repair the damage. 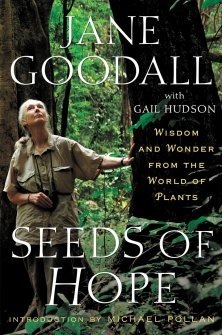 Goodall and “Seeds of Hope” will always be associated, to some degree, with plagiarism. Even if the book, when published, is impeccable in terms of its attribution and sourcing, the publicity it received for its unattributed passages will remain. The tragedy in all of this is that it could have easily been prevented. Not only could Goodall have been more careful about use of her sources, but also her editors could have been more active in attempting to detect potential issues. Either way, the problems could have been detected and corrected before it was ever sent for review and any issues would never have become public. While Goodall certainly has earned a certain degree of trust and leeway form a publisher due to her reputation and experience. The truth is that any author, no matter how experienced or clean their record is to date, can make poor decisions. We’ve seen this time and time again, from Jonah Lehrer to Stephen Ambrose, veteran authors being caught in plagiarism scandals. The truth is that, just because an author has a history of doing good, ethical work does not mean that there isn’t either problems under the surface or, equally likely, problems under the horizon. While those who have a long history of good work are certainly less likely to plagiarize, those who have such a strong background make for much bigger news stories when their potential cases are discovered. Would Jane Goodall’s case have received this much press if she were not Jane Goodall? Probably not. The same goes for Lehrer, Ambrose and others. The end result is that publishers need to be vigilant with every author, including those they trust the most. Because all authors are human and, while the chances may be lower, the potential dangers are much greater when dealing with authors that have a high profile.